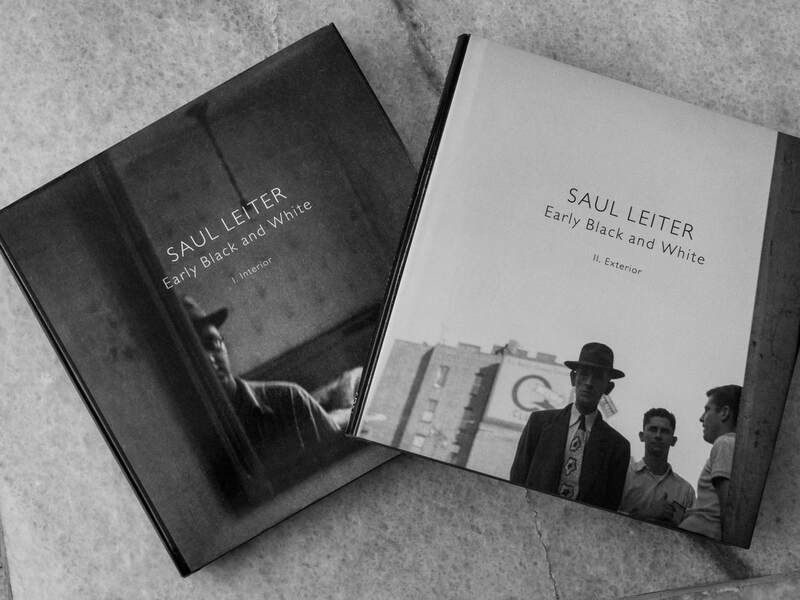 This is a short review on Saul Leiter's book entitled "Early Black and White" but before we jump in, I thought I would share a bit of what I think of this photographer while showing some of the photographs from the book. 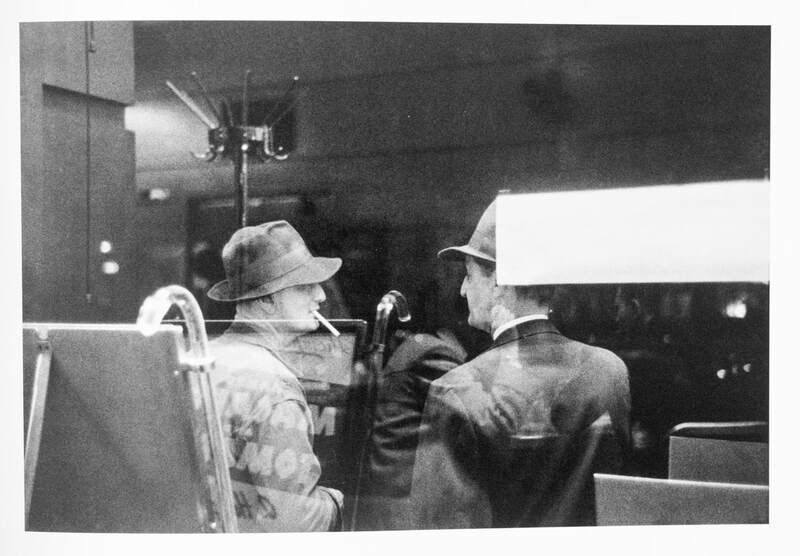 I will add a section at the end of this post, to shot you some good sources of information on Saul Leiter. 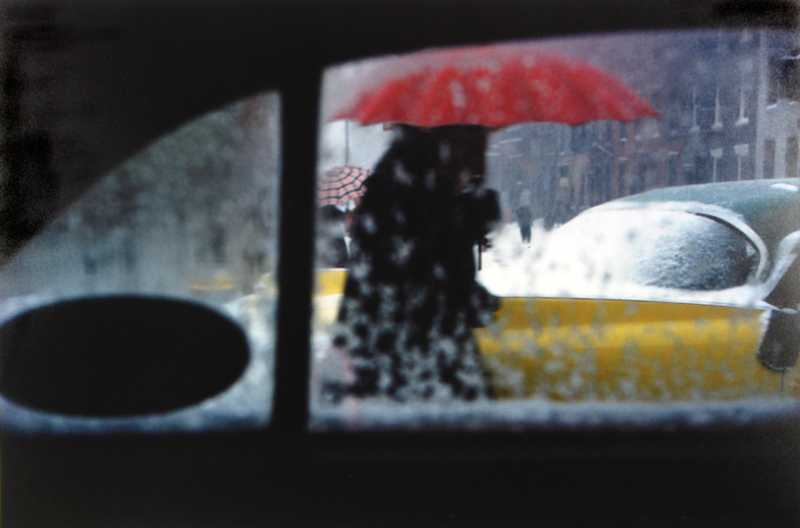 Saul Leiter was a phenomenal photographer who was known for his commercial work until about a decade before he died. He was rediscovered for his personal work, which far overshadows his commercial work in terms of quality and character (in this instance I am defining 'character' as that ability to stand out of a crowd). He is known for his work in color, which is dramatic and modern in its feel. But he did a great deal of work in B&W, which has been largely overlooked until very recently. 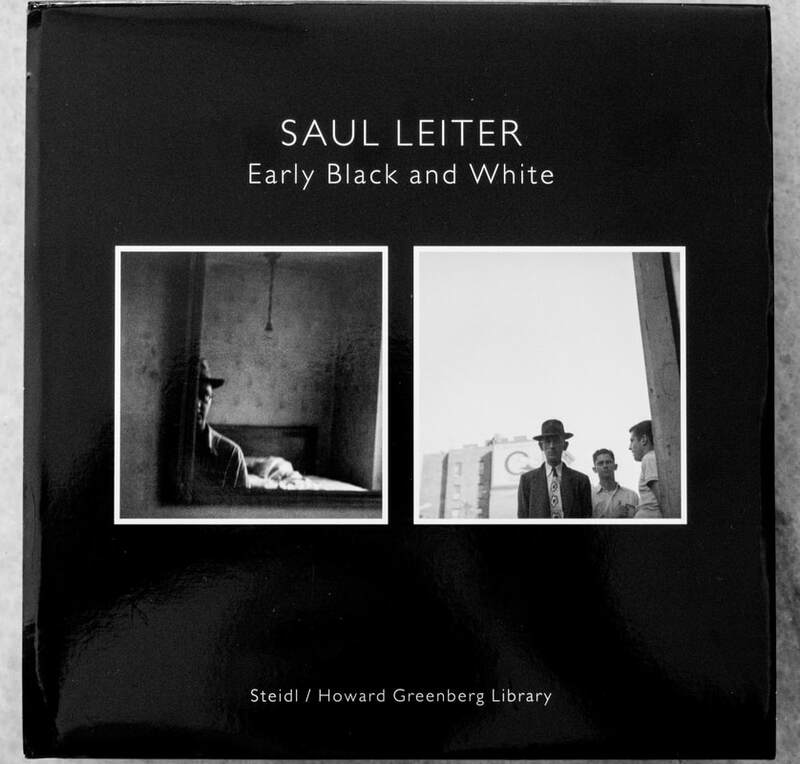 The publication of this book, ends the categorization of Saul as a color photographer. If you were to compare his color work with his B&W, it would be difficult to say that they came from the same man. His B&W photography, while modern, seems to follow a more traditional form while his color work is a complete departure from the traditional photography. I believe Saul saw the work through color and B&W seemed a bit of a compromise for him. At left you have one of my favorite color pictures of Saul Leiter. You can see muted colors, a glass with snow and condensation between you and the subject. You can see odd shapes but also shapes that help you understand what you are looking at. You have the clear shape of the window that outlines a scene. The scene is blurry due to the wet window but through it you see a black mass which is defined by a red umbrella he/she is carrying. The yellow car behind her seems to be a taxi of some sort. It is a common, everyday moment which any New Yorker would see in winter. We are taken along for an instant in the back seat of that car. This is classic Saul Leiter, where he uses odd vantage points to bring you to a level of intimacy with the subject that surprises me time, and time again. The muted colors always have a large part of the story to tell. People are important but not as individuals, but as part of the street. They form a part of a living street with color, shapes and motion all coming together. While I really feel this way about his color work, I should add that Saul would disagree. He defined his photographic style very clearly and he hated philosophical interpretations of his work. But this is how his color work feels to me. Looking at his B&W work, through both volumes of this work, we find a very different approach. Here to the right we see a photo of his office taken through a door. We see that he is placing us as a visitor, seeking a glance at an office that is not ours. This image does not give us the intimacy of his color images. The vantage point is more obvious and the interest is in the fact that we are spying into someplace that is not ours. His color work by comparison, brings us into a scene and makes it our own. 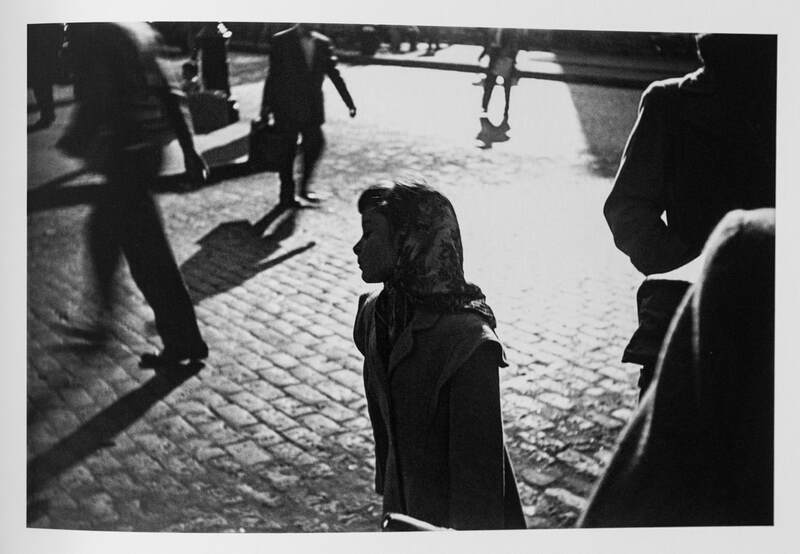 If you know Saul Leiter's work in color you will be surprised by is B&W work. With the Interior book, we have more intimate shots of family, himself and models. With the Exterior book we have more shots of strangers on the street, outdoor shots and we have a feeling of walking into the scene. Both books have an excellent forward which helps put Saul in context. Then the words give way to his photographs which are left to tell their own story. Saul grew up in a very traditional home which placed a high value on intelligence and academic study. Saul seemed to rebel opting to pursue painting. Looking at his paints you can see the parallels with his color photography, not because both are in color but because of his preferred subdued colors. 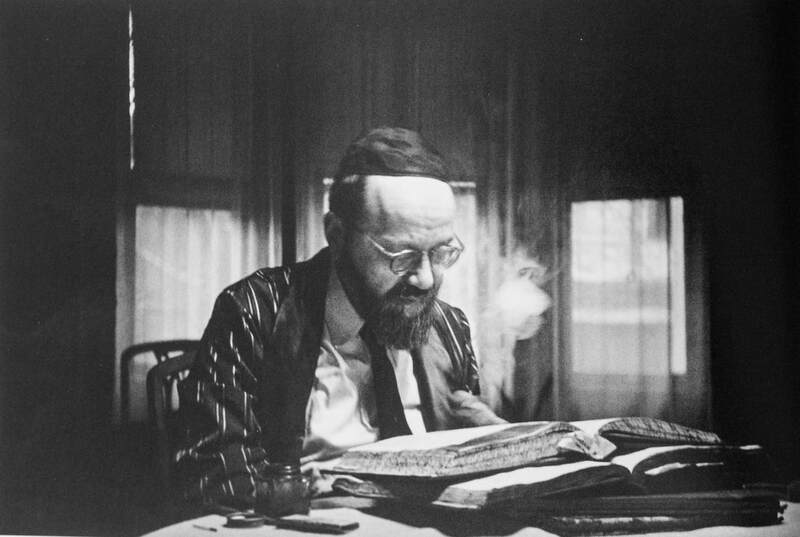 Here we have a portrait of his father, a Rabbi studying while surrounded with pipe smoke. The vantage point is of us sitting at the same table, perhaps in the middle of a religious lesson. The photo is taken with respect, as would be expected of a traditional family. The lighting helps convey a sense of mystery and his father's tie even when sitting informally, gives us a sense of distance which conflicts with the intimacy of the vantage point. With this image we have a typical cluttered desk of a photographer. You can see his shutter trigger, flash cable and even a rangefinder along with a paint brush (presumably for dust) and some old photographs. There seems to be a weight of some sort on the upper right and in the lower left we have a glass with scissors, pens and some small paint brushes. I love these still life images. 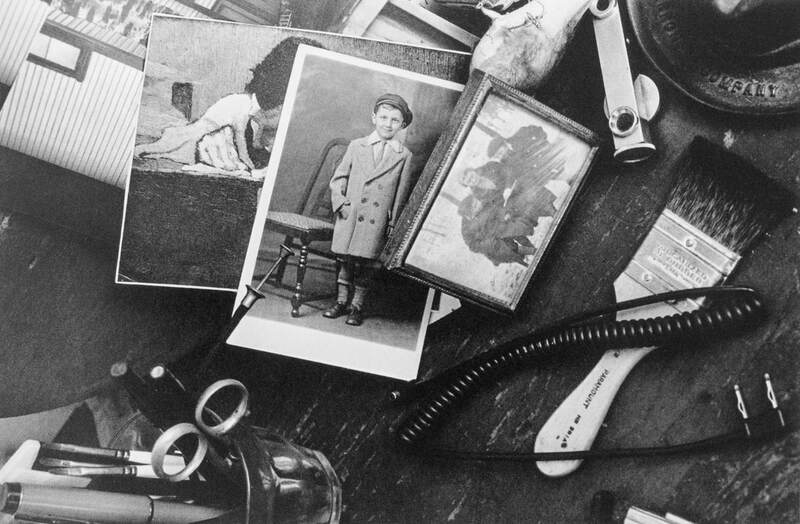 They give us a great deal of insight into the person and place and gets me thinking to my own desk and the little items that collect on it. Again this is clearly an interior shot. 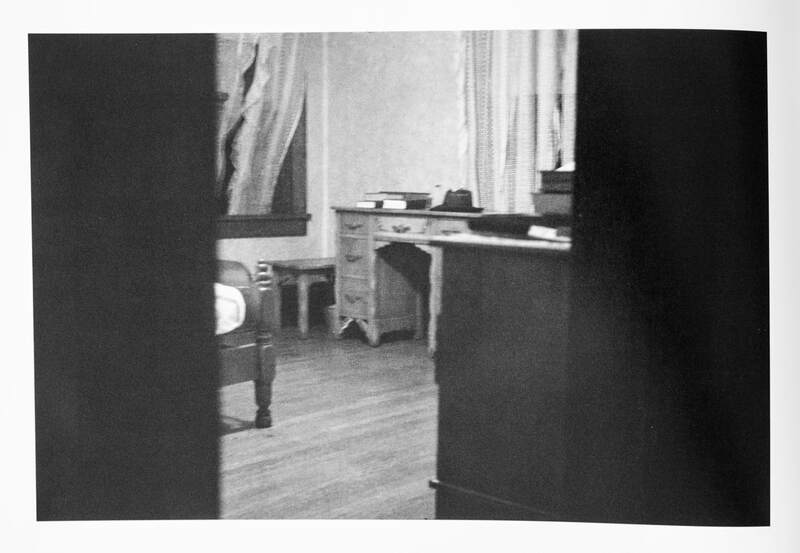 But here we have an image that is found in the interior book which helps define what Saul was referring to when he labeled this section "Interior". Here we are standing on the outside looking into the balcony of a neighbor. 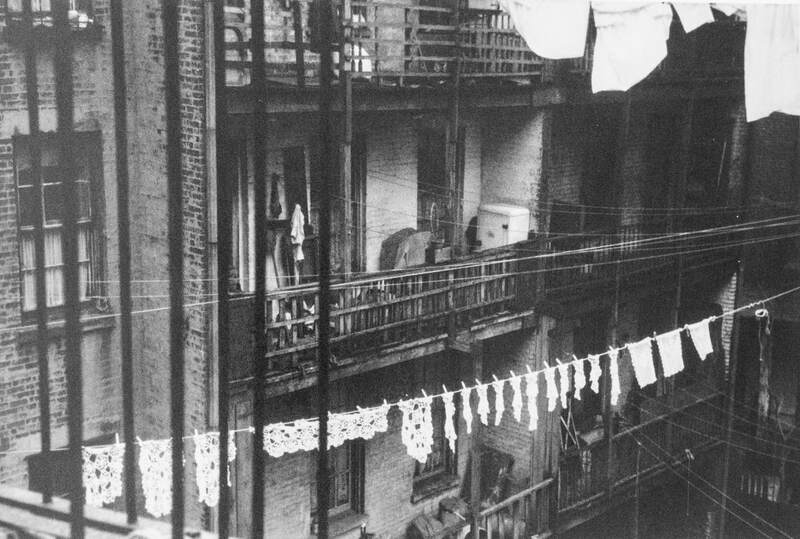 While this is clearly not the viewers house, the close proximity, exposed brick, the hanging laundry and the overall tenement feel gives us a sense of intimacy. This is the thread that links these pictures together. These are the balconies of people the viewer knows, neighbors in the old sense of the world. They would watch the kids when the parents were out, help when you are sick, it is an intimate relationship because of proximity and circumstances versus familial relations. In the Exterior book we see something very different. Here we have the silhouette of a girl with a scarf. She is a black shadow in a sea of reflected light from the cobblestone street. We do not know her, how could we as we cannot really see her, but we see her and know she is a young girls. All around her we see movement of adults. Men carrying briefcases, a suited man moving off to the left of the image. A man walking off to the right. In the background we see a man crossing the street in a hurry. All around this girl is a halo of white light. The adults around her make you feel as if she is behaving as an adult, but it is wrong. She should be playing with dolls. Here we have another shot from Exteriors. At first glance we are confused between what is reflected and what is real. We soon realize that we are sitting inside and we are looking out. We can see the two meant standing, talking to one another, hat brims down. In the reflection we see a hat stand an internal light and what might be some booth seats at the lower right of the image. There is a reflected sign as well. Again here we are spying on two men as they speak outside. We are sitting in a warm dinner drinking some stale coffee and we witness this exchange. Maybe one man is asking for a light. Maybe they are going to share a cab. We do not know but we were able to spy on the scene and wonder. While not all the images in these books is worthy of such dissection, it is a wonderful collection of images of a side of a photographer we have not seen before. I keep going back through the images and consider the vantage point that Saul is giving us. While his B&W work will not have the monumental attraction that his color work does, it is a great collection of a talented photographer. I purchased these books while in Singapore. I was walking through an old mall with a great deal of old camera stores when I saw this off to the side of a display. I asked if it was for sale and jumped on it when confirmed. It will always remind me of that little store, filled with dusty camera equipment and some lovingly maintained books. Here are some videos worth watching if you want to learn more about Saul. Who Influenced Saul Leiter is a great AOP video. See it HERE. Another AOP intro into Saul Leiter. See it HERE. Listen to the man himself HERE.